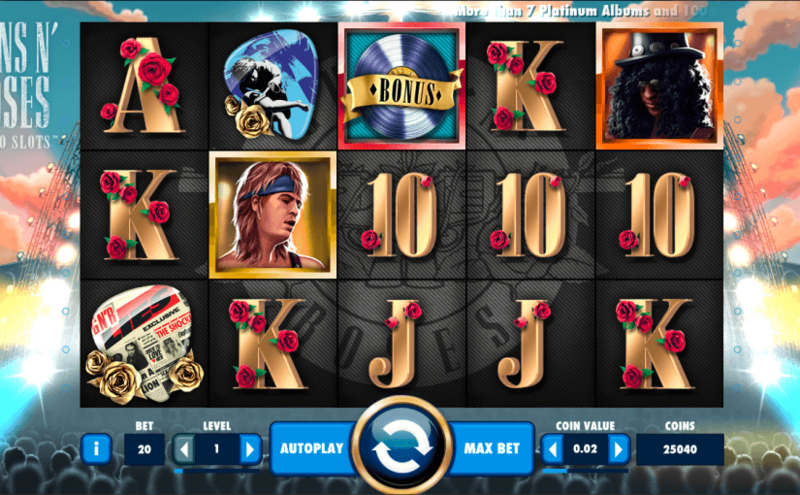 Select your song, then see if you can win up to €225,000 on the official Guns N’ Roses slot. Free spins, random big-win features and three rockin’ bonus modes await. Guns N’ Roses offers: Maximum win on a single bet: €225,000, Five reels, 20 paylines. The official Guns N’ Roses is packed with a full set list of big-winning features. Enjoy random features including expanding wilds, legend spins, Appetite for Destruction wilds and solo multipliers. Land three bonus scatters on reels 1, 3 and 5, then spin the bonus wheel to trigger one of three bonuses: encore free spins with stacked wilds, the crowd pleaser pick-and-click mode, or a big cash win. Land three or more Axl Rose symbols to win up to €750.